I have been adding Notes to my AncestryDNA "4th Cousins or Better" matches over the past year or so. It's been frustrating to have to click the Note icon in order to see the Note text. Earlier this year, I was introduced to the MedBetter DNA Chrome extension and downloaded it to my computer, and have been using it. "MedBetterDNA version 3.0 doubles the number of hashtag filters from previous version. MedBetterDNA can help people who have taken the AncestryDNA Test. 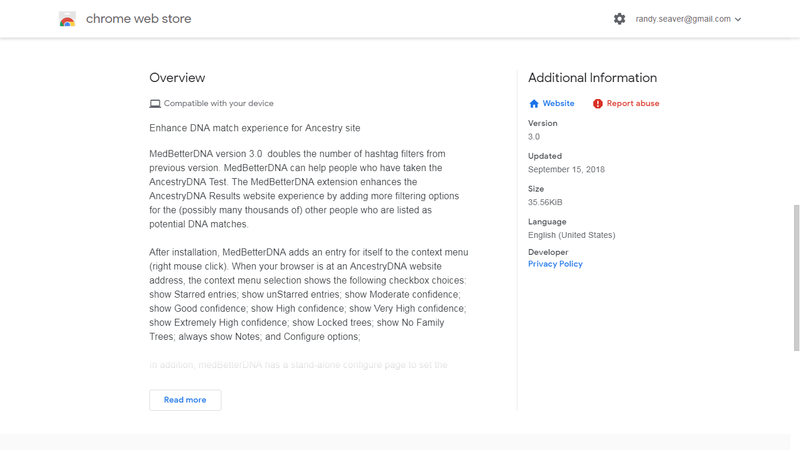 The MedBetterDNA extension enhances the AncestryDNA Results website experience by adding more filtering options for the (possibly many thousands of) other people who are listed as potential DNA matches. "After installation, MedBetterDNA adds an entry for itself to the context menu (right mouse click). 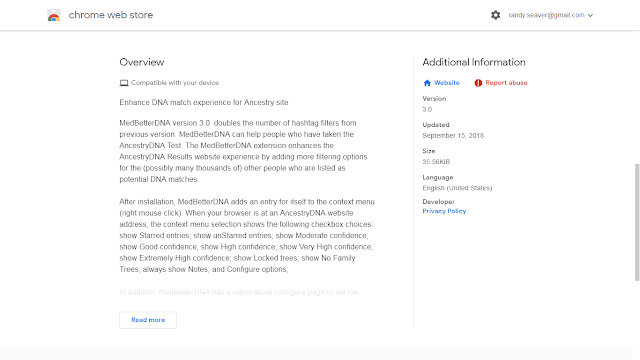 When your browser is at an AncestryDNA website address, the context menu selection shows the following checkbox choices: show Starred entries; show unStarred entries; show Moderate confidence; show Good confidence; show High confidence; show Very High confidence; show Extremely High confidence; show Locked trees; show No Family Trees; always show Notes; and Configure options." 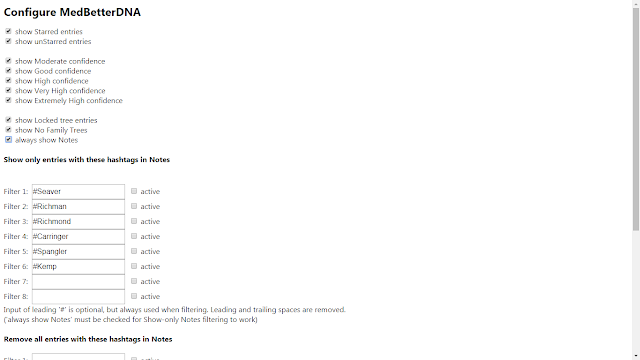 After installation and the icon appeared in the Chrome browser, I opened it and set up my "Options:"
The only thing I changed was I clicked on "Always show Notes" and added six Filters so I can see which matches are connected to a specific surname. * Is line in my RootsMagic tree? * Is DNA match in other DNA lists? What other item should I put in my Notes on AncestryDNA? I really like this app or extension (whichever it is) Randy. I too add lots of notes. And, I’m happy to see that I include pretty much the same things you do. Total cM's, whether we have shared matches and if so with which family members, the surname or couple, if I know who they are or who they might be. I don’t add anything about the size of their tree (good idea) or whether the line is in my Legacy tree. What I do add is whether I sent them a message and if so, when. I send a feedback message to Ancestry every time I get frustrated with having to open a match to see my note. That's a lot of feedback. This is very helpful, thanks for finding it for us. Thanks for sharing this. I tried some time ago and couldn't find anything that worked well with a Mac, but this one does! 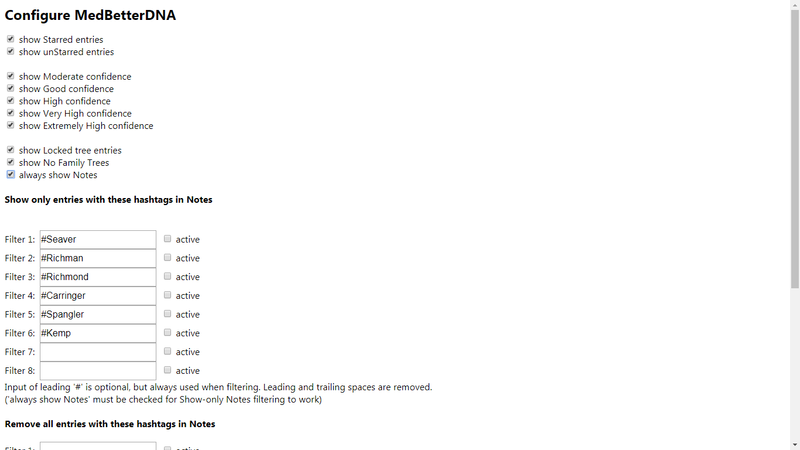 It helps so much to have the notes show. I click on "Shared Matches" and list the top shared matches in the note - it helps me group the shared matches, particularly if I don't know who the common ancestor is. I love this Chrome extension!